While travelling by train to Niagara Falls in the summer of 1852, Cropsey was impressed by the "Durandish landscape" of Western New York with its dense clusters of trees, flat green meadows, and tidy white houses. On his return from the falls Cropsey visited his artist friend, Thompkins Harrison Matteson, who had recently moved to Sherburne, New York. He spent a week with Matteson sketching the scenery of Chenango Valley. It is "very beautiful, full of beautiful trees, " he wrote to his wife, lamenting that "I wish I had time to stop here a month." View near Sherburne, Chenango County, New York, with its towering mountain rising as a backdrop to a bucolic scene teeming with human activity, is far removed from Cropsey's more topographical views of the gentle valley. The canvas, with its shifting perspectives, forms a montage of details celebrating the virtues of industry, harvesting, and leisurely pleasure-including picnicking figures in the right foreground-and takes on a fanciful tone. The enchanting quality of the Chenango Valley was jocundly described by the artist as looking "Iike the Land of Beulah only I don't see the figures with shining wings, ... And the celestial city owing to much dust in the road, and a hazy atmosphere, is not distinctly visible, but I think it may be seen from the church." Cropsey was not only referring to Bunyan's epic, but to his own study which he made in 1850 for the Land of Beulah (now entitled Ideal Landscape: Homage to Thomas Cole, Thyssen-Bornemisza Collection) that was utilised for Kyle and Dallas' Panorama of Bunyan's Pilgrim's Progress. The trees on the right side of View near Sherburne which frame the setting sun, relate specifically to the earlier study for the panorama in which similar trees frame the view of the Celestial City. 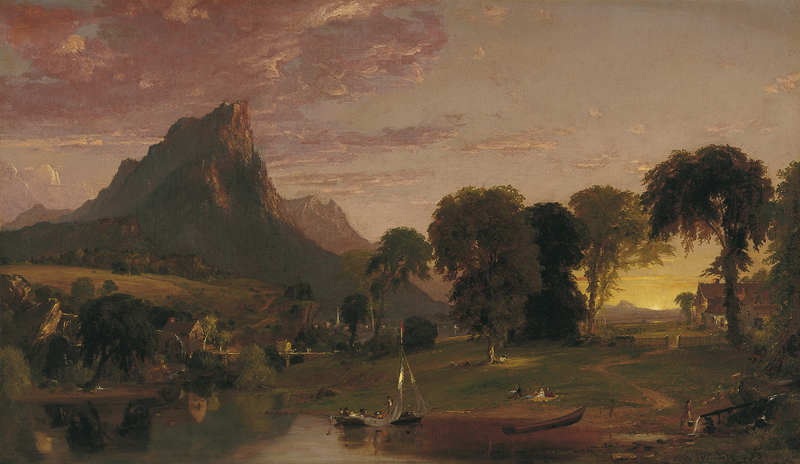 Cropsey was undoubtedly influenced by Frederic E. Church's New England Scenery, 1851 (Springfield, Massachusetts, George Walter Vincent Smith Art Museum), which was exhibited at the American Art Union in 1851 and sold at auction the following year. His painting uses the same panoramic format as Church's composition and shares with it such elements as the foreground body of water, towering mountain, mill, bridge, and distant church spire. While in New England Scenery, the Conestoga wagon travelling over the foreground bridge intimates "manifest destiny, " the more distant, but almost identical bridge in Cropsey's painting is crossed by a hay wagon, an equally potent symbol expressing the bountifulness of the American land. Cropsey's own display of nationalism is seen in the centre foreground of his composition. From the stern of the boat, its sails about to be furled, an American flag trails in the water, allowing Cropsey to reaffirm his intense patriotism within the conventions of the pastoral landscape. The reproduction of the images made available free of charge by the Fundación Colección Thyssen-Bornemisza for the purposes described in paragraph 4 are protected by copyright. The material may not be reproduced without first obtaining a licence from the author of the work or from the corresponding copyright holder. The material may not be reproduced without first obtaining a licence from VEGAP, (for more information go to www.vegap.es). 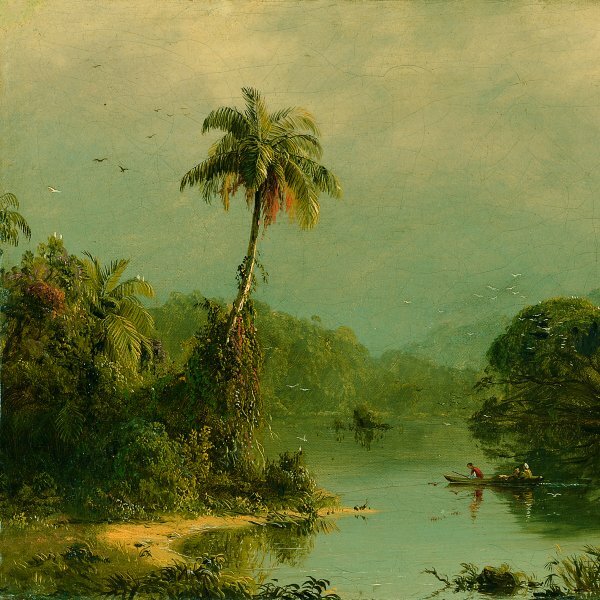 Any previously licensed reproductions of the copyrighted images, whether in part or in whole, must mention the copyright holder and the following note: Provenance: Carmen Thyssen-Bornemisza Collection on deposit at Museo Thyssen-Bornemisza, Madrid.